Crydda Cottage is a beautiful detached stone cottage, tucked away in a private sunny courtyard. 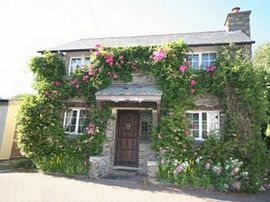 The cottage is conveniently located in the heart of Croyde village, a few minutes walk from a choice of pubs, restaurants and village stores. The cottage is full of character with a wealth of original features. 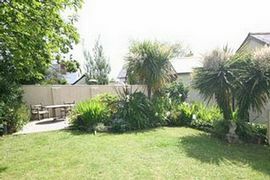 It has been very well equipped and totally refurbished throughout, in a style which complements the property. 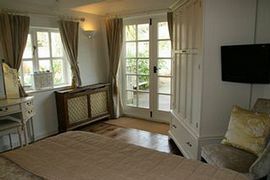 There are two welcoming living areas with oak flooring and comfy sofas, 4-5 cosy bedrooms with wardrobes and Plasma TVs. The master bedroom has a spacious balcony out onto the upper terrace of the garden, and en-suite bathroom with separate walk-in shower cubicle. There is a well appointed main bathroom with stone effect tiling, underfloor heating and luxury spa bath and a further downstairs shower room, with a walk-in shower. 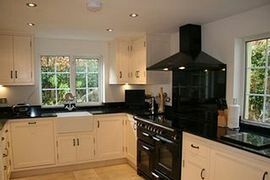 A recently re-fitted country kitchen with underfloor heating, marble floors, Range Cooker, American style fridge, washer-dryer, dishwasher and microwave. Outside there is a beautiful terraced garden. The lower terrace is equipped with an outdoor shower and hanging rack for wet suits. There is also an outside lockable shed providing secure storage for surf boards, and beach equipment. The upper terrace is enchanting; fully stocked with established plants and shrubs, it is peaceful, private and totally enclosed. There is a sun trap decking area, two sets of tables and chairs (for seating up to 12), gas BBQ and external lighting. It is a really great place to chill out after your day on the beach! There is a short walk to the beautiful sandy beach and National Trust headland of Baggy Point. Saunton Sands (4 miles long!) and Putsborough,Woolacombe beaches (blue flag) are a couple of minutes by car. Croyde has a family friendly beach with cafe, shop and showers etc, there is also a surf school, and riding school. The area is renowned for its picturesque coastal walking trails and there are several excellent golf courses nearby including the renowned Saunton Sands Golf Club. Bedding is provided for all the beds except for the cot. Towels can be rented for £3 per week per set (a set is 1 X hand towel and 1 X bath towel). Pets welcome for a small fee to cover the extra cleaning required. Outdoor BBQ, decking garden furniture and large sun trap country garden. By car M5 from Junction 27 take A361 to Barnstaple stay on A361 to Braunton, then B3231 through Saunton to Croyde Bay. By Train to Tiverton Parkway - further train services to Barnstaple. 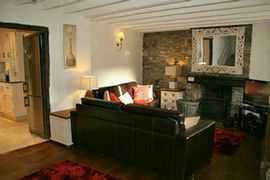 Price range from: £750 - £2120 for a full week at Crydda Cottage. Our changeover day is on a Friday. From mid-September to mid-April we take weekend and weekday bookings (minimum 2 night stay).